1. Add orange juice, pineapple juice then tequila to a highball glass. 2. Pour grenadine over top. It will sink to the bottom creating that beautiful gradient sunrise look! 3. Create your sunrise garnish by starting with a slice of orange, then layer on a slice of pineapple and then finally add a maraschino cherry. 4. Using a cocktail pick, go in from a 45˚ angle towards the top of the back of the orange. Poke through the orange, then the pineapple, then the cherry. The garnish should rest nicely on top of a highball glass. Hooray for Fridays! The end of the week and sometimes celebrated with cocktail. This particular Friday we’re celebrating with a Pineapple Tequila Sunrise. Today I’m making Tequila Sunrises but with a little twist—I added some pineapple! A splash of pineapple juice gives this classic cocktail some major tropical vibes. I happily discovered that when you layer an orange slice, a pineapple slice, and a maraschino cherry, you get this super fun little “sunrise” garnish. Total justification for adding pineapple right there but also the flavor is really awesome too. These drinks would be great for a luau or just as a refreshing beverage to enjoy on the porch while catching up with friends. It’s really easy to make this virgin also, just leave out the tequila. The kids or friends who don’t drink don’t have to feel left out. What to do with leftover pineapple? In case you’re wondering, which you’re probably not but I’m going tell ya anyway… here’s how pineapple juice ended up in these tequila sunrises. Well, see, I had a lot of leftover pineapples hanging around from when we grilled pineapples the other weekend (we topped them with ice cream and caramel rum sauce. Yum!) And because I’m never one to waste food I’ve been hanging on to these leftover pineapples waiting for the perfect opportunity to add them as an ingredient to a recipe. I totally get that from my grandmother, who I distinctly remember always drank leftover fruit juice straight up from the can rather than pouring it out. So, yeah, I was prepping these tequila sunrises in order to share a cocktail idea with you all and I wanted to make these a little different than just your typical tequila sunrise and then—bingo! I realized I had found my opportunity to use those pineapples and the juice. My grandma would be proud and I know she would have loved these cocktails. I’m sure you’re going to love them too. They are just so pretty to look at! They’re really easy to prepare just be sure to follow the instructions for adding each ingredient to achieve that layered sunrise look and whatever you do—don’t stir! What you’ll need to make these pineapple tequila sunrises. The only thing special you might need for this is a set of highball glasses and cocktail picks. If you want to go all out, maybe some paper straws. 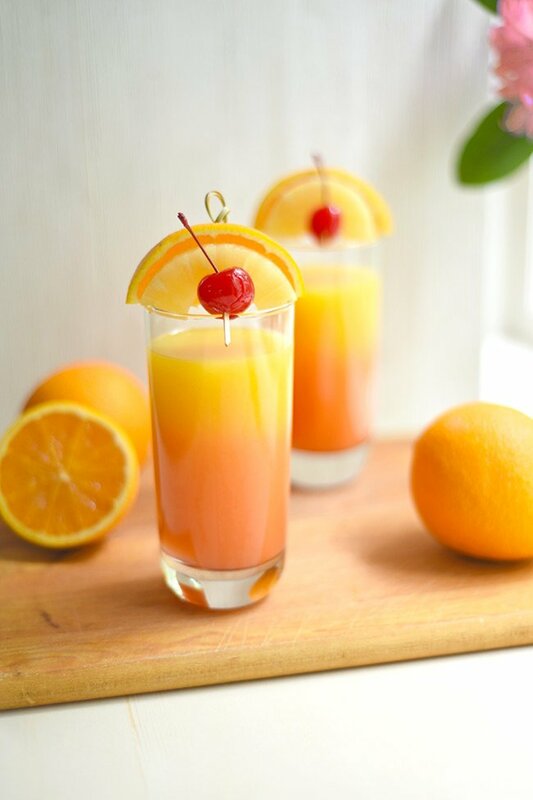 This cocktail recipe for Pineapple Tequila Sunrise was featured on Saturday Sparks!